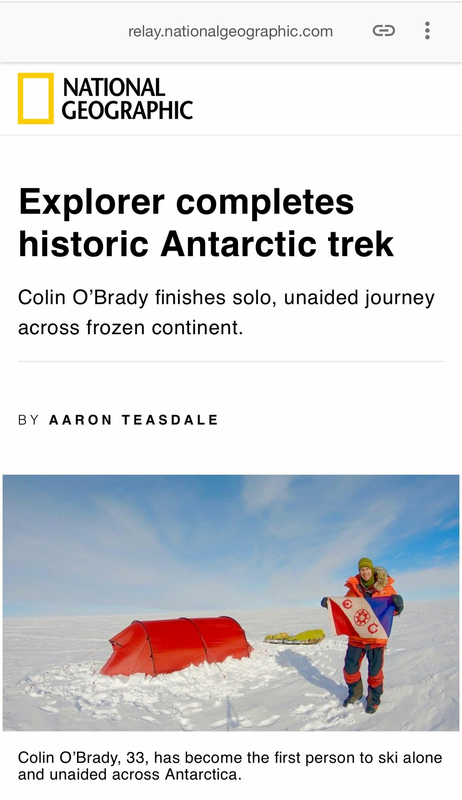 Enjoyed Colin’s crossing of Antarctica? Be the first to receive information about the book. solo, unsupported, unaided crossing of antarctica. Expedition was live November 3 - December 26, 2018. NEW MAP!!! Watch Colin cross Antarctica live. The Impossible First expedition will be tracked with accurate GPS, monitoring Colin's every step. The tracking will remain live for the entire duration of the expedition for anyone wishing to check in on his daily progress. The satellites will be pinged every 30 minutes to show Colin's exact location. UPDATE 11/27/2018: As many of you are probably aware, Colin has reached the southernmost capabilities of Garmin’s live tracking display making it difficult to watch Colin’s progress on their mapping platform. We’re excited to share the new map tracker above which features all the data directly imported from Garmin in a more visually appealing layout! If you’re interested in Colin’s Garmin tracker, you can still visit share.garmin.com/colinobrady as well. Only the daily track summary in addition to Camp waypoints are available on Garmin’s platform at this point in the expedition. 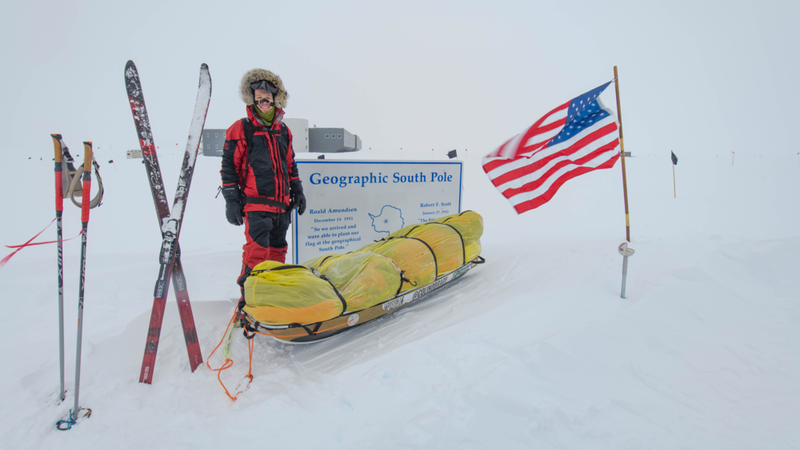 December 12th colin made it to the south pole! Holding up the weight of the world from the bottom of the planet! 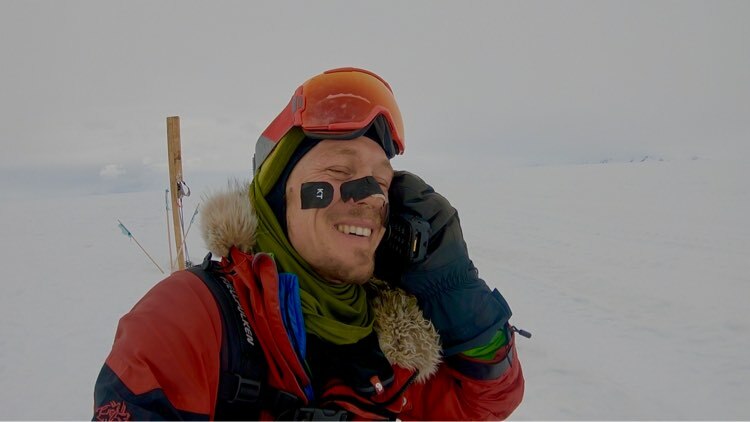 UPDATE 12/12/2018: Colin arrived to the South Pole on December 12, 2018 (Day 40), a major milestone on The Impossible First expedition. He’s just passing through, making a short stop to take some photos, and then he’ll be on his way out. Colin’s got 360 miles more to go to reach his final destination, the Leverett Glacier on the Ross Ice Shelf, and arrive at the opposite edge of Antarctica. Onward! Fun Fact: Amundsen became the first explorer in history to reach the South Pole on December 14, 1911. Read more! Follow Colin’s journey on Instagram for daily updates from the ice. Colin O'Brady is attempting a world first - A solo, unsupported, unaided crossing of antarctica. Harkening back to the turn of the 20th century, humans have been trying to cross the continent of Antarctica. Everest has been conquered, oceans have been sailed, rowed and even paddle boarded across solo - however, from the time Shackleton first set foot in Antarctica over 100 years ago, a solo, unsupported and unaided crossing of Antarctic still remains unfinished, leaving it one of the last remaining iconic “firsts” in modern exploration. 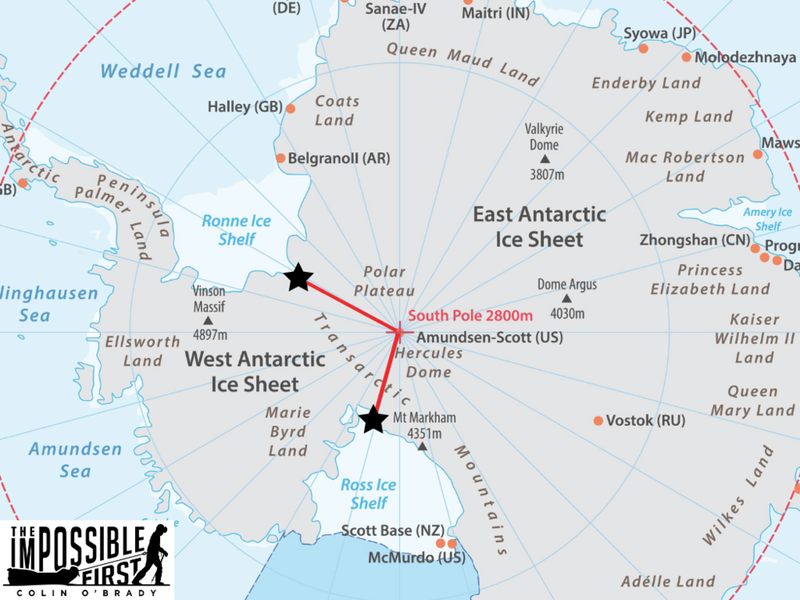 Worsley and Saunders individually attempted via the historic Berkner Island starting point in reverence to Shackleton’s footsteps. Historically, other intrepid polar explorers have achieved solo Antarctica crossings with the assistance of kites or resupply. In ‘96-’97 Norwegian Børge Ousland managed the first solo crossing of Antarctica without resupply, but with the aid of parafoils from Berkner Island to the Ross Sea. In 2012 Felicity Aston completed a solo, unaided Leverett Glacier to Hercules Inlet crossing becoming the first woman to cross Antarctica solo! She received two supply drops. Other Antarctic expeditions have also been achieved. 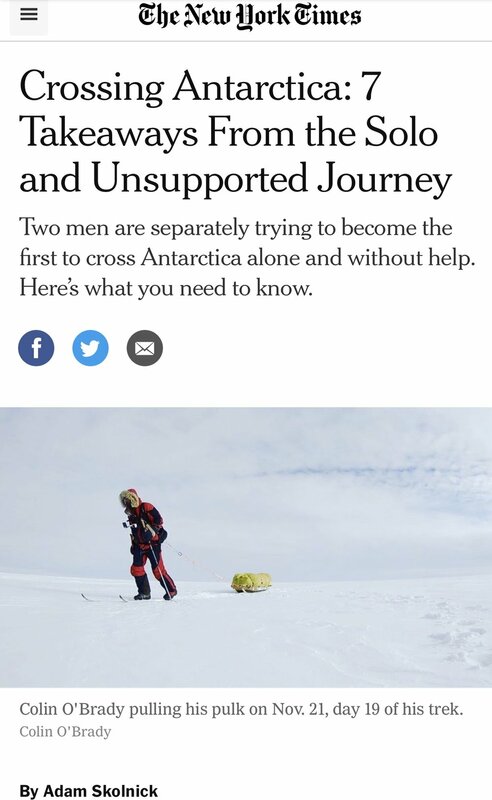 To date, a solo, unsupported, unaided crossing of Antarctica remains unfinished. This project is for anyone who has ever been told their dreams are impossible. A 1000 mile journey across the frozen continent in 70 days. Alone, unaccompanied. An individual pursuit. No resupplies or food caches. Colin must survive with only what he can carry in his sled. He cannot accept food, fuel or gear to replenish his diminishing supply. Human powered. No outside assistance from machines, dogs, wind/kites etc. Colin will complete the crossing on foot. Antarctic expeditions are not for the faint of heart. Beyond being the southernmost continent, Antarctica is the coldest, windiest and driest continent on the planet. With this being a solo expedition, Colin’s well being is 100% in his own hands. He will pull a 400 pound sled with all of his equipment and food, and battle high winds and -40 degree temperatures. Antarctica will present many challenges with fields of sastrugi and white-out conditions. He’ll consume ~8000 calories per day to maintain enough strength to complete the expedition. Beyond the physical stressors, he’ll need to remain mentally tough alone on the ice. Colin has been working with the top doctors at The Standard Process Nutrition Innovation Center to create a custom diet to optimize his nutrition. One of his goals is to prove that not only is this project possible, but also that organic whole food nutrition is one of the keys to success. Antarctica is the world’s largest desert - a desert being classified as a region that receives very little precipitation. Average elevation of 7500 hundred feet. The driest and highest continent. The windiest continent, with gusts reaching up to two hundred miles per hour. The coldest continent, with temperatures in the interior falling below -75 degrees. 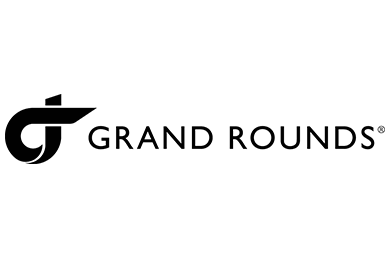 During the summer season (Nov-Feb), the sun is visible 24 hours per day. Scientists have used the Antarctic to test spacesuits for Mars, where the average surface temperature is -75 degrees. Since a solo, unsupported and unaided crossing of Antarctica has never been completed, the route is open to be trail blazed. Colin will attempt to complete the route from North to South. He will be dropped off on the Ronne Ice Shelf, on the edge of the frozen Antarctic continent, at the Messner starting point. The beginning of this route is inspired by Reinhold Messner’s 1989 epic Antarctic crossing to the South Pole, for whom the starting point is named. Colin has long admired Messner, an Italian mountaineer, adventurer and explorer. Messner was the first to climb Mt. Everest without supplemental oxygen with Peter Habeler, and the first to ascend all fourteen 8000 meter peaks. Colin will traverse 566 mi (911 km) from the starting point to the South Pole and then continue South. It’s another 360 miles (578 km) to reach the Leverett Glacier at the edge of the Ross Ice Shelf on the opposite edge of the continent. A crossing that has never been completed before. UPDATE: Colin was dropped off at his starting point on November 3, 2018 around 3pm local Chilean time. British Captain Louis Rudd is also attempting to complete a solo, unsupported, unaided crossing of Antarctica. Originally planned for a different route - Hercules Inlet to Leverett Glacier via South Pole - Rudd elected to change his route to the Messner Start, and as such Colin and Rudd were dropped off just miles apart from one another to begin their individual crossings. Best of luck! Find out what’s next for Colin! Another exciting adventure awaits.